The Left misses the point, again. “Democratic strategist Christine Pelosi, the daughter of House minority leader Nancy Pelosi, shared the meme in support of the drive to sign people up for Obamacare before the looming March 31 deadline. 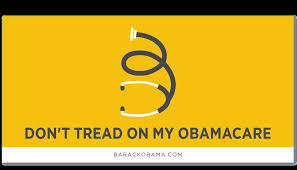 In a new bumper sticker playing on the Gadsden flag, her group, Democracy Partners, replaces the defiant snake with a similarly coiled stethoscope with the words, “Don’t Tread On My Obamacare.” When Colonel Christopher Gadsden presented the flag to the plucky Continental Navy in the first months of the Revolutionary War, I doubt he intended it to be later used as a symbol to bolster a massive and intrusive government program.” ‘Don’t Tread on My Obamacare’? “Q: What is the Gadsden “Don’t Tread on Me” flag?” Gadsden Flag: Too Racist for Government Buildings, But Just Right for Obamacare Propaganda! “Nothing so encourages an aggressor as the perception of weakness in his antagonists. Barack Obama hasn’t even processed that he is an antagonist. Why, he means no one any harm (except perhaps Republicans). Didn’t he reset relations with Moscow? Didn’t he promise in 2012 to show “more flexibility” toward Putin after the election? Didn’t he say, over and over again, that a “decade of war is ending” and that we are going to do some “nation building here at home”? Did he not maneuver the United States into “leading from behind” in Libya? Hasn’t he pressured allies like Israel to make concessions to the Palestinians while permitting Mahmoud Abbas to skate? Hasn’t he let bygones be bygones about the Snowden unpleasantness? Hasn’t he drastically reduced defense spending? Didn’t he give Assad a third chance after drawing red lines? Hasn’t he sought to ingratiate himself with China’s brutal regime (his family is traveling there this week)? Didn’t he permit Putin to oversee Bashar Assad’s supposed surrender of chemical weapons? How could a leader be more unthreatening?” Why Obama Scares Me: He’s feckless, and his foreign policy is inconstant. “Ethnic studies do a disservice to many of those immersing themselves because it promotes intellectual ghettoization to the detriment of education. And while feminist theory, gender theory, and racial theories might sound good in narrow academic jargon, too often they become a cover to supplant research with politics. Simply put, theory is for people who don’t have libraries. Two cheers for the Black Student Union at Michigan for starting a debate. But now that debate is opened, perhaps it can be pursued to the opposite conclusion, one that prioritizes educational rigor over politics and inclusiveness over separation.” Time to Eliminate Ethnic Studies? “‘Karl Marx wasn’t wrong, just early. Pretty much. Sorry, capitalism. #inequalityforevah” When trying to condense a sweeping, 700-page analysis of the past, present, and possible future of capitalism into an 85-character tweet, you’re bound to miss a few things. But the above Twitter-fication of economist Thomas Piketty’s much-awaited Capital in the Twenty-First Century captures the gist of the author’s argument. Piketty thinks the German progenitor of Communism basically got it right. It’s only that his essential insight — private capital accumulation inevitably leads to the concentration of wealth into ever-fewer hands — took a hiatus during the middle part of the last century thanks to depression and war hurting the fortunes of the well-to-do. But now Marxism’s fundamental truth is reasserting itself with a vengeance, a reality borne out in both Piketty’s own meticulously gathered data and in business pages replete with stories of skyrocketing wealth for the 0.001 percent and decades of flat wages for everyone else.” The New Marxism: A prominent liberal economist contends capitalism will inevitably increase inequality. From Greg Gutfeld’s latest book “Not Cool, The Hipster Elite and Their War On You.” “In February 2013 it was revealed that Facebook paid no income taxes for 2012. As reported by CNN, among other places, the social network was due a tax refund of almost 430 million bucks. Now, this is a company that made one billion before taxes (which buys approximately 50 million hoodies for Mark Zuckerberg). But they were able to secure the refund because of a tax deduction from stock options issued to Facebook employees. I won’t pretend to understand how this works (as an English major, I have no discernible skills other than spelling discernible correctly), but I know this: that because this company happened to be Facebook, the story was a one-day affair. It came and went like an ice cream headache, leaving neither a bruise nor a hickey on the Zuckerberg Empire. If this company were something that actually made something in a factory or field, it would be roundly condemned by every single media hack on the planet.” Why the ‘hipster elite’ isn’t cool. “But why is it cool to give up something to go to a remote corner of the earth? After all, staying in a job that you love at a company that is relentlessly looking for new ways to make money by offering products and services that people want is much more likely to produce results. You are far more likely to have a positive impact on people around the globe by being part of an organization that develops, manufactures and sells a higher yield crop, a cheaper car, a new pharmaceutical drug, a more durable fabric for clothing, satellite TV service, online shopping solutions, and the like. But no, that is not cool, at least not compared to selflessly serving in the Peace Corps or some similar organization.” Living the Cool Life: Join the Peace Corps or Corporate America? Forgotten history. This: “Critics of Rep. Paul Ryan’s remarks about cultural factors in the persistence of poverty are simultaneously shrill and boring. Their predictable minuet of synthetic indignation demonstrates how little liberals have learned about poverty or changed their rhetorical repertoire in the last 49 years.” And this: “The family is the primary transmitter of social capital — the values and character traits that enable people to seize opportunities. Family structure is a primary predictor of an individual’s life chances, and family disintegration is the principal cause of the intergenerational transmission of poverty. In the 1960s, as the civil-rights movement dismantled barriers to opportunity, there began a social regression driven by the explosive growth of the number of children in single-parent families. This meant a continually renewed cohort of adolescent males from homes without fathers; this produced turbulent neighborhoods and schools where the task of maintaining discipline eclipsed that of instruction. In the mid-1960s, Moynihan noted something ominous that came to be called “Moynihan’s scissors.” Two lines on a graph crossed, replicating a scissors’ blades. The descending line depicted the decline in the minority — then overwhelmingly black — male unemployment rate. The ascending line depicted the simultaneous rise of new welfare cases.” Ryan’s Critics Are in Denial:Liberals have had decades to learn the lessons of dependency. False pretenses. “A Washington Post story purporting to expose the Koch brothers as behind-the-scenes beneficiaries of the Keystone Pipeline has been exposed as an utterly false propaganda operation, hilariously wrong and politically malicious. Even worse, one of the writers behind the story is married to a political operative in the left wing Koch-demonization machine. The Washington Post was recently purchased by Jeff Bezos of Amazon, who ought to take a hard look at the reporters and editors who collaborated with the left wing smear machine, and while he is at it, should send a note of thanks to John Hinderaker, the blogger at Powerline, who exposed the rot in his new media operation. Hinderaker’s work is thorough, grounded in fact, and devastating. I urge you to read the whole thing.” Washington Post busted! “Let me offer an alternative explanation of why the Washington Post published their Keystone/Koch smear: 1) The Washington Post in general, and Mufson and Eilperin in particular, are agents of the Left, the environmental movement and the Democratic Party. 2) The Keystone Pipeline is a problem for the Democratic Party because 60% of voters want the pipeline built, while the party’s left-wing base insists that it not be approved. 3) The Keystone Pipeline is popular because it would broadly benefit the American people by creating large numbers of jobs, making gasoline more plentiful and bringing down the cost of energy. 4) Therefore, the Democratic Party tries to distract from the real issues surrounding the pipeline by claiming, falsely, that its proponents are merely tools of the billionaire Koch brothers–who, in fact, have nothing to do with Keystone one way or the other. 5) The Post published its article to assist the Democratic Party with its anti-Keystone talking points.” JOHN HINDERAKER: The Washington Post Responds To Me, and I Reply to the Post. “Some lies just won’t go away. In February the Washington Post published an article with the following headline: “Why There’s No Democratic Version of the Koch Brothers’ Organization.” It was the umpteenth attempt to explain, in a particularly simplistic manner, how the millionaires and billionaires who donate money to the Democratic party are nothing, absolutely nothing, like those meanie cancer-research philanthropists Charles and David Koch.” The Media’s Democratic Donor Delusions: We’re supposed to believe the Kochs are evil but leftist billionaires are disinterested givers?